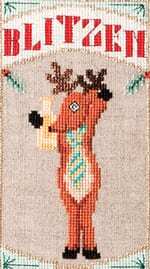 Reindeer Games is a delightful and comical play on words! Let’s just say that we are taking the names of Santa’s reindeer beyond the literal sense and just having some good old fashion fun! Look at the design and it speaks for itself. 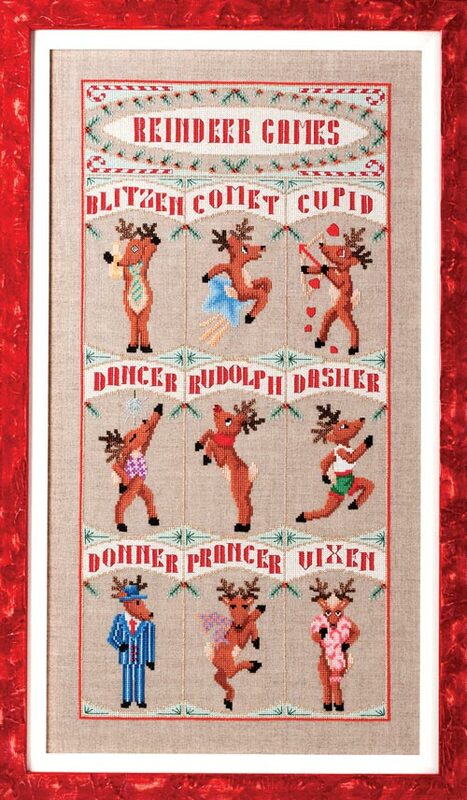 You’ll find Comet holding on tight as he shoots across the sky aboard a shooting star, and you’ll have a hearty chuckle when you see Dancer stepping out under the silver ball, reminiscent of the 70’s disco dance craze. Does that stance remind you of anyone? Oh, and get a load of that hot tamale Vixen with her pink feather boa and frilly garter. 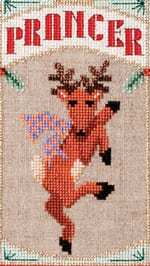 So now you know the mischief that Rudolph and his pals are up to when they’re not hard at work pulling Santa’s sleigh! 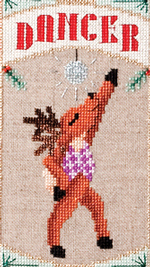 Picture/Mural – Stitched on 32ct Linen Natural-Brown (65B) provided by Wichelt Imports, Inc. Stitch count is 156w X 322h. Design area is 9 3/4″w X 20 1/8″h. Stitched 2 over 2. 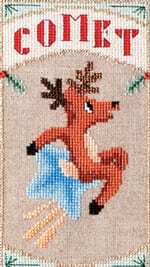 Bellpull/Banner – Stitched on 27ct Penny Natural 4.7″ wide stitching band. 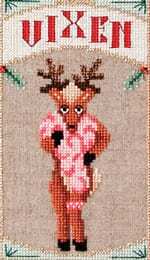 Stitch count is 48w X 678h. Design area is 3 3/8″wX 48 3/8″h. The design requires 50 inches (1 yd. 14 inches) of stitching band. 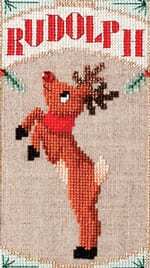 However, depending upon how you decide to finish your bellpull or banner, it is strongly suggested that you order at least 1 3/4″ yards of the stitching band and begin stitching precisely in the middle. This will ensure you have sufficient selvage on both ends for finishing your bellpull or banner. The bellpull hardware that was selected for this design is provided by Wichelt Imports, Inc., Item #39714 – Bellpull Brass-Satin 14cm. 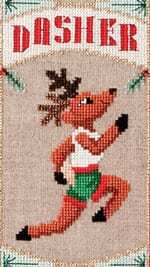 Picture/Mural – Uses a total of 39 colors of Anchor/DMC/or Sullivans USA, 3 colors of Kreinik #4 Very Fine Braid, 2 colors of Kreinik Cord, 1 color of Mill Hill Beads, and 1 Mill Hill Crystal Treasure. 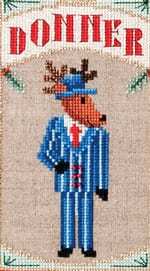 Bellpull/Banner – Uses a total of 38 colors of Anchor/DMC/or Sullivans USA, 2 colors of Kreinik #4 Very Fine Braid, 2 colors of Kreinik Cord, 1 color of Mill Hill Beads, and 1 Mill Hill Crystal Treasure. Available for purchase from Cindy Dunlow Frames, Six Gun Plaza, 4901 E. Silver Spring Blvd., #701, Ocala, FL 34470, (352) 236-4263, E-mail: cdframes@aol.com. * 3 skeins needed for picture. Color not used in bellpull/banner. 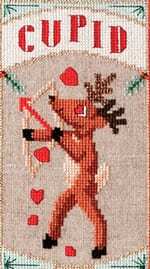 ** If using Anchor 1042, 2 skeins are needed. If using DMC or Sullivans USA, only 1 skein of each color is needed and will be blended, 1 strand of each. Please be advised that there is not a comparable color for Anchor 1042 in the DMC or Sullivans color palette. If you do not wish to blend two colors to achieve the desired results, it is highly suggested that you use Anchor 1042 for this particular part of the design.